If ever there was a single moment that encapsulated why football fans continually long for a return to club football it might have been the sight of Nicklas Bendtner stepping up to the penalty spot on Tuesday. Even the self-proclaimed ‘greatest fans in the world’ showed they have their limits as thousands of Irish supporters left their seats and headed towards the exit signs at the Aviva Stadium during the midst of Denmark's drubbing of the Republic of Ireland. Irish fans in attendance had paid their respects to the dearly departed but they clearly weren’t in the mood to watch Bendtner, of all people, shovel the final bit of dirt on Ireland’s World Cup coffin. But when the state televised funeral had finally come to an end and the realisation set in that Ireland had been eliminated from yet another World Cup play-off, there were, inevitably, a lot of angles to cover for Irish news outlets. Invariably, the manager’s future was pushed right to the forefront of the coverage and everything from his half-time substitutions to the dearth of quality players available to him was analysed, dissected and squeezed for everything it was worth. And we do squeeze every last drop, read Sunday’s newspapers, we were still writing about it five days later. The return of club football was supposed to be the initial release from this misery, the first step on the road to recovery, but it became very clear on Saturday that it was not a release but merely a continuation of the bleakness. Say what you will about the aesthetic quality of international football, and you might have a lot to say on the matter if a Martin O’Neill Irish side is mentioned, but if the ugliest thing to come out of the latest international break is the Ireland v Denmark first leg in Copenhagen, then ultimately, it’s a win for football. But the Copenhagen debacle was not the ugliest thing to come out of the latest international break, far from it, the racial abuse of Ireland defender Cyrus Christie was much harder to digest than anything Ireland could conjure up on the pitch over two legs. Football may be a beautiful game to watch when players of Mesut Ozil’s caliber are on form but it turns ugly when Ozil’s club tweet an animation of the player sipping a cup of tea in response to a provocative piece of writing from Adam Crafton in a combined XI article from the Daily Mail. The provocateur in question, Adam Crafton, revealed that he had been subjected to anti-semitic and homophobic abuse, as well as people wishing for his death, for picking 11 Tottenham players in a hypothetical combined XI team between Tottenham and Arsenal players. There’s an argument to be made that Crafton deserved some backlash for his decision when Arsenal defeated Spurs 2-0 on Saturday, but he definitely did not deserve to have people wish for his death and to be abused in a variety of ways over something as meaningless and as insignificant as a combined XI article. Arsenal did not help the matter when they tweeted the animation of Ozil sipping tea to their 12 million followers on Twitter, but think of how many vulgar and awful people that you know in your own life, then think of how many there could be in a sample size of 12 million with the added protection of anonymity through the form of an unattributable username and an egg shaped avatar. However, even when fans are not protected by anonymity, it still doesn’t stop some of them from yelling monkey chants towards Spurs midfielder Dele Alli. UEFA can run anti-racism campaigns from now until the end of time, and they certainly have tried on this front, but whether it’s on a train in Paris, a football stand in North London or from an undisclosed location through the means of social media, racism and football will seemingly forever be intertwined. 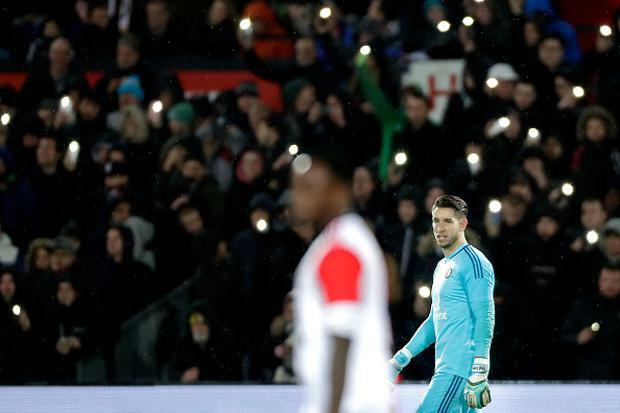 But just when the misery starts to compound, Feyenoord fans provided a glimmer of hope with a touching gesture to their goalkeeper Brad Jones. Six years ago today, Brad Jones' six-year-old son Luca died of leukemia. In the 11th minute of the Eredivise champions 1-1 draw with VVV-Venlo on Saturday, Feyenoord fans started to collectively sing You’ll Never Walk Alone to commemorate the sixth year anniversary of the death of Luca Jones, Brad Jones’ six year old son who passed away on November 18, 2011, following a prolonged battle with Leukemia. It was a touching moment and a reminder of the power that football and sport can have in bringing people together to overcome adversity, however, it’s a mere footnote in a week where football has been used as a means to perpetuate hardship more so than it has helped alleviate it. They say sport reflects society and society reflects sport. Thankfully, Feyenoord fans managed to show that there’s still some beauty under the face of the beast. Independent.ie Newsdesk Leeds' automatic promotion hopes suffered a major setback as they slumped to a shock 2-1 defeat at home to 10 man Wigan.